i just remembered that i had a dream last night of a yellow-billed cuckoo. in my dream i didn't have a great look at the bird (i didn't have binoculars), but it was very clear it was the yellow-billed cuckoo. so exciting even in a dream. brian and i saw this bird once when we were out birding in charlottesville. we were walking around a natural area and just happened to get lucky. they're supposed to like catepillar nests, and there are tons of those in virginia in the springtime, but we've only ever seen the one yellow-billed cuckoo--in real life that is. 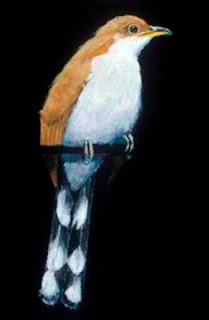 if you're interested in this bird, there's a great audobon painting of two yellow-billed cuckoos in a paw paw tree. that picture is actually sitting on my office desk. it's great. monday was william's 8th birthday. to celebrate we had a big family birthday party on sunday. we had 26 people in our house, which qualifies as big for us. it went really well. he decided to have the theme be gilligan's island so we had a pin the coconut/fish/starfish on the wall game and all of the kids got cute white sailor hats. then on monday we had a bowling party with some of william's neighborhood friends. that was a good time. all of the kids wanted it to bumper bowl except william--so there were no bumpers. they all had a good time. after that the three of us went to wendy's for dinner (w's choice) and then opened presents and had a little cake and ice cream. by the end of the day we were all tired! but it was a lot of fun. thanks to all who helped it be such a fun birthday. william got a lot of nice presents and really enjoyed the parties and everything. at church yesterday we had a combined third-hour meeting for men/women and even the teenage boys and girls to learn about wise stewardship of the earth. yes, you heard me correctly: we had a presentation on how important it is to "tread lightly" on the earth. it was so great. and the presenter, a man who studies environmental-cultural issues at byu, was wonderful. he was able to explain how taking care of the environment is a spirtitual imperative and gave us a good list of issues we could all realistically work on. one of the suggestions--to walk to church--is something i think we'll try. probably not every sunday, but now that we have church at 11am, it's not so difficult to do it.